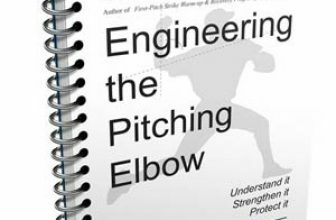 Balance is the most important aspect of pitching. Without balance, there is no control. Without control, there are no strikes. Without strikes, there is no pitching. That said, a pitcher’s first goal — especially a beginning pitcher — should be to have balance from his first movement to his release. Beginning the motion in balance is easy enough: stand straight up. When working from the full windup, make a small step backward and maintain your balance. This is the point where many neophytes make their first mistake, by stepping slightly (or fully) to the side, and/or by stepping too far. Either of these movements will throw your balance off. So again: step directly back and just a few inches. A good rule of thumb (or toe) is to step straight back behind the rubber, with your toe just barely brushing the back of the rubber. The purpose of stepping back is to firmly plant your pivot/push foot. Step back just enough so that you can maneuver your pivot foot (right foot for righthanders, left foot for lefties) in a comfortable spot against the rubber. Once that foot is planted, pivot your hips and lift your opposite knee up toward your chest and above your pivot knee. Notice I stated “lift your knee” and not “lift your foot”. 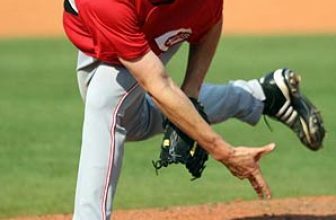 Lifting your foot, or “kicking” will put the wrong visual into a pitcher’s head, and possibly throw the body out of balance. 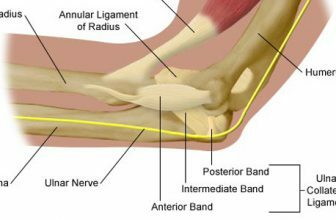 Although many people might call this part of the motion the “kick”, I avoid that term because of the possibility of imbalance. Instead, call it the “knee lift”; it gives a more positive visual. The knee should be lifted as high as you possibly can while still maintaining balance. You should be able to hold yourself in position for 5-10 seconds. If you can’t, then you need to either work on your balance or lift your knee lower. Generally speaking, the higher you can lift your knee (in balance), the more power you will generate. So, a pitcher should work on keeping his balance while getting his knee as high as he possibly can. Luckily, this is a fairly easy action to accomplish. All it takes is standing on one leg. Do two drills: (1) lift your knee as you would in your motion and hold, and (2) standing straight with your arms crossed over you chest, lift your weak (left for righties, right for lefties) foot back behind the same knee, so that your heel is almost touching your hamstring. Do these drills with your eyes open and your eyes closed, and hold the position for as long as you can. Count as you hold, and make goals (for example, start with 5 seconds, work up to 10, then 15, then 20). You can do balance drills anywhere: at home, in an elevator, on a subway car, on a bus, wherever (a buses and trains are fantastic places for advanced drills, if you don’t mind people looking at you like you’re crazy). Once you have accomplished great balance with your knee lift, it will be very easy to stride in balance, and thus release the ball in balance … and the result should be more strikes. In fact, a pitcher with very good balance should be able to throw strikes with his eyes closed — literally. Try it for yourself: after working on your balance for a few weeks, try, from the stretch position, pitching with your eyes closed. If you’ve achieved proper balance, you may surprise yourself by throwing perfect strikes.